thanks so much for befriending me! My name is Cory and I live in New England with my Wife and our 3 children. I have been an avid fan of reptiles as long as I can recall. My primary interest has always been Snakes, though I have always loved Geckos as well. I recently rescued a Leopard Gecko from a sub-par local pet store. 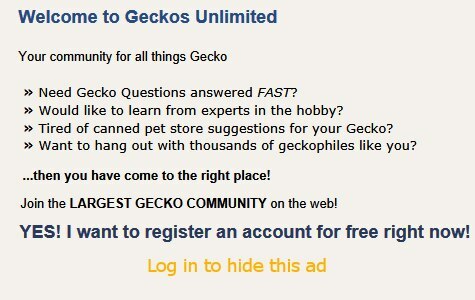 Even though I am new to the Gecko world, I have done a ton of reading on them so I do know a little bit. Hopefully here I can expand my knowledge of these wonderful little animals and maybe help out others who are new as well. 10:44 PM - CWilson13 mentioned mecoat in post My Gecko is Climbing! 09:28 PM - Elizabeth Freer mentioned CWilson13 in post Phoenix worms do smell! 09:32 AM - CWilson13 mentioned wicked gecko in post Gosh darn heating pads. 11:47 PM - CWilson13 mentioned Moxie in post Confusion regarding Leopard Gecko heating requirements? 03:57 AM - Elizabeth Freer quoted CWilson13 in post Finally got my Garg! 05:52 AM - CWilson13 quoted NicKtheGreeK1997 in post Finally got my Garg! 10:41 PM - CWilson13 quoted Elizabeth Freer in post Finally got my Garg! 03:33 PM - CWilson13 quoted desi_babs in post Need gecko advice! Emergency!!! 01:47 PM - desi_babs quoted CWilson13 in post Need gecko advice! Emergency!!! 08:17 PM - CWilson13 quoted Elizabeth Freer in post Help with Weight of my Leo please? 04:27 AM - Elizabeth Freer quoted CWilson13 in post Help with Weight of my Leo please? 05:47 PM - CWilson13 quoted NicKtheGreeK1997 in post Finally got my Garg! 08:55 PM - CWilson13 quoted Elizabeth Freer in post Finally got my Garg! 08:38 PM - Elizabeth Freer quoted CWilson13 in post Finally got my Garg! 10:28 PM - Elizabeth Freer quoted CWilson13 in post 14 Feb 2017: And NOW 2 Cyrtodactylus peguensis zebraicus hatchlings! 10:32 AM - CWilson13 quoted Elizabeth Freer in post Finally got my Garg! 02:19 AM - Elizabeth Freer quoted CWilson13 in post 14 Feb 2017: And NOW 2 Cyrtodactylus peguensis zebraicus hatchlings! 08:22 PM - CWilson13 quoted Elizabeth Freer in post Finally got my Garg!